As the festive season comes to a close, the annual melee of car launches takes off, with Jaguar leading them all out of the blocks. However, even keen followers are seeing little difference against the rude handling 2000 model, and already the critics are suspicious of the team's chances. Rule changes for this year amount to a higher front wing, with a less effective rear wing. All the teams will have recovered the downforce lost from reducing the diffuser size with sculpted undertrays. Other changes are cosmetic, from a performance viewpoint, so basically the cars are the same as last year, but with a little less downforce. Accordingly, most of the teams are expecting to produce similar cars in 2001 to those they raced in 2000, at least in appearance. The underlying aerodynamic concept that McLaren so powerfully proved in 1998 will still be visible in all the cars on the grid this year; indeed, by mid season, all the teams expect their aero packages to produce within 3% the downforce of a similarly configured McLaren or Ferrari. However, that's not to say the performance gap will disappear. Mechanical grip is at a premium, so suspension geometry and the cars' balance will be important. Engines are still critical: indeed, traction control should go a long way to demonstrating the horsepower differences between makes, as there will now be little driver intervention to control wheelspin under acceleration. Braking is even more important, as the drivers� delicate timing and touch will be the only difference between cars with similarly powerful engines. 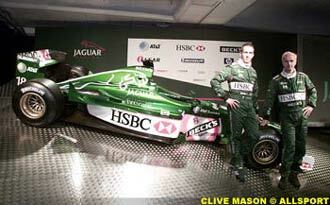 At launch, it was loudly commented that the Jaguar R2 is visibly similar to the 2000 car, but with "many changes underneath." Revisiting the rear suspension � trying to dial out the lethal break-away rear end � is the biggest visible change, whilst the CR-3 engine attempts to make the step that last year the CR-2 failed to manage. With the cars so close together in performance, attention to detail is going to be important. This year � more than any other to date � will be about "the whole package," making steady evolution, rather than revolution, the only realistic route forward. It comes as something of a surprise, particularly with their off-season testing times, but much of the paddock chatter concerns a team who have spent recent years in the doldrums. Benetton � or Renault, as they should really be called already � are tipped as the team on the move for 2001. It's no secret that since Renault bought the team from the Benetton family in 2000, they have been pouring money in to the outfit, returning their trusted lieutenant Flavio Briatore to the helm, and putting much effort into revitalising their engine program for the challenge ahead. This year, they have a lean, powerful engine, taking many of the important design concepts to new lengths in the search for a lower centre of gravity. They have incorporated their widest V yet � from 111° in official reports, to 120° in the rumour mill � in the new unit, placed pumps in strange places, and relocated anything heavier than air that could possibly be moved to the bottom of the car. sRenault know that with BMW and Honda joining the Mercedes and Ferrari fray, they have a huge job to do, but this year the engine should perform within a whisker of the front runners. By 2002, they should also be as light and as fuel efficient as the leaders. Of course, at this stage, there are compromises too. It seems that there is so much material low down, that when there is more than a gallon or two of fuel in the tank (about enough for out, hot and in laps), it is stored above the relocated components; furthermore, the total tank size is supposed to be compromised. It is an indication that the team are targeting improved qualifying as the key to their 2001 season, and it will be interesting to note how their pace changes in racing trim. Benetton have a solid performer in Giancarlo Fisichella, despite a late season lapse in 2000, and an up-and-coming driver in Jenson Button, who despite his lack of years has demonstrated a knack for getting good results out of the car. His performance in 2000 led many to wonder whether Frank Williams was making the right move in farming out a character who has almost universally been tipped for a shot at the top... but Briatore has no qualms about taking him on. He watched Button with interest as he worked with Schumacher, learning to get the best from the car. 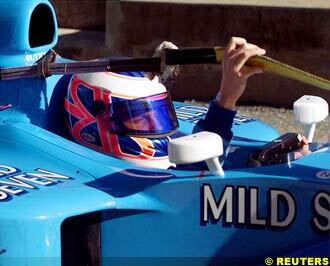 For 2001, he expects Button to go even quicker, as he pushes harder to find performance limits: with Renault money behind the budget, a few trips through the kitty-litter will be a small price to pay for holding the car on the edge. The only real question marks for the New Year lie with the chassis. The new car had its concept penned early, with a good aerodynamic basis (another benefit from the small engine). In the downside, however, despite headhunting Mike Gascoyne from Jordan, he was not able to get on-board until late in the design process, which fairly effectively limited input into the concept stage. Nevertheless, news from inside the team tells he has certainly made a noticeable impact since arriving: reworking the rear suspension geometry and divulging useful aero tweaks. This year, come launch time, the spectacle which is traditionally put on to convince sponsors of the wisdom of their investment will actually be backed up by steel: the team themselves believe this will be a solid year, and they are looking for results. Arrows has launched the AX3 � another two seater Formula One car. This model is evolved from the original, intending to bring performance even closer to the "real thing." Insiders believe this new car is better than the McLaren two seater � something that was not said about the original. Jordan's new venture into powerboats is seen as an astute move by their financial backers. Although not in the top formula, Jordan is looking to break in on the scene in the same fashion as he did in Formula One through the nineties. Powerboat racing is expected take off in a similar fashion to F1 if the sponsorship picks up; Jordan is anticipating their arrival will spark a big influx of interest and money in the sport. ITV is looking to recruit Nigel Mansell to bolster their presentation team. Following strong, positive feedback after he guested alongside Tony Jardine and Jim Rosenthal at the 2000 British Grand Prix, ITV are looking for a multi-race deal in 2001. They are also expected to approach Stirling Moss and Jody Scheckter among other famous Formula One faces to be rolled out this year. Olivier Panis and Pedro de la Rosa are being viewed dimly by the FIA after speaking out against the regulation changes for 2001. De la Rosa's comment that the car "feels a lot looser, especially in the high speed turns," has simply demonstrated that the changes fulfil Max Mosley's requirements to improve safety by cutting cornering speeds. Board members at Honda are concerned by the company's Formula One spending. When Takeo Fukui stated that they want to win a race this year, and sweep the podium next year, he was reflecting pressure from the board to cut expenditure: supplying works deals to two teams is being viewed as expensive, and is proving hard to justify. Jaguar are facing some problems with their new Silverstone site. The local council has rejected their plans for a 1200 space car-park, as they would prefer to see more workers on buses.